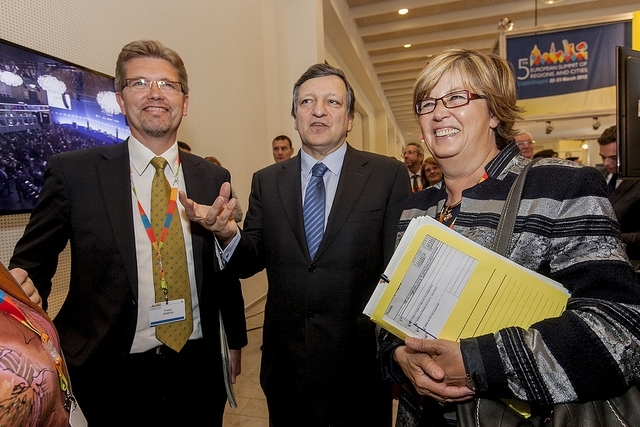 “We need sustainable growth from a financial, but also environmental point of view,” Barroso said on the opening day of the fifth European summit of regions and cities taking place in Copenhagen on 22-23 March. To support growth, the Commission president flagged the EU’s 2020 strategy and the €1 trillion multi-annual budget for Europe currently being negotiated for the 2014-2020 period. “But if we want growth, we need to own it. It is not enough to talk about it, it is for all levels of governance, including regional, to make it work,” he said in an apparent reference to the Lisbon Strategy, adopted in 2000 and which notoriously failed to turn the EU into the world's most competitive region by 2010. But economic growth is not everything, Barroso suggested. Quality of life is also important and Europe’s cities are ahead compared to other parts of the world. “We should be proud of this. The Chinese want to learn from us,” Barroso said, referring to the recently launched EU-China partnership for sustainable urbanisation. In July, Chinese officials will come for a two-week training trip to Brussels on regional policy legislation and multi-level governance. Also, on 19-20 April, the Committee of the Regions will host a panel debate on green urbanisation called “The EU and China – Partners for a Green World". Barroso said that cities are important in green growth, because political discussion, including on the EU’s next 2014-2020 budget, should also take place at local level. “This is critical for the results of the discussions. The word citizen comes from city,” he remarked, calling for local authorities to play a greater role in the budget negotiation. The next EU budget should be conceived like a pot of money for targeted investment, Barroso added, saying that “a cohesion policy with an urban agenda is taking shape”. Mercedes Bresso, president of the Committee of the Regions, said cities have a crucial role to play in the current economic crisis. "The transition to a green economy will require appropriate funding and EU policies and the development of innovative financial systems involving local partners, banks, private companies and civil society,” Bresso said. Hungarian MEP Zita Gurmai, in charge of the European Citizens' Initiative together with MEP Alain Lamassoure, said that current discussions were lacking the concept of solidarity. Citizens should be involved in the urban development and ongoing budget negotiations, through short, medium and long-term planning, Gurmai said. “There is a growing gap amongst our citizens, we have to do more to address it, for example through the European Citizens Initiative… But do citizens know about it?,” Gurmai said. “Cities have to be at the table as equal partners,” added Burkhard Jung, mayor of the German city Leipzig. EU regional policy accounts for one-third of the EU budget, at around €50 billion per year for the current budget period, which runs from 2007 to end 2013. The Committee of the Regions (CoR) is the EU's assembly of local and regional representatives, and as one of the EU institutions, provides sub-national authorities with a direct voice in Brussels. CoR officials believe the entry into force of the Lisbon Treaty will give regions a greater influence in EU decision-making (EURACTIV 10/02/10).